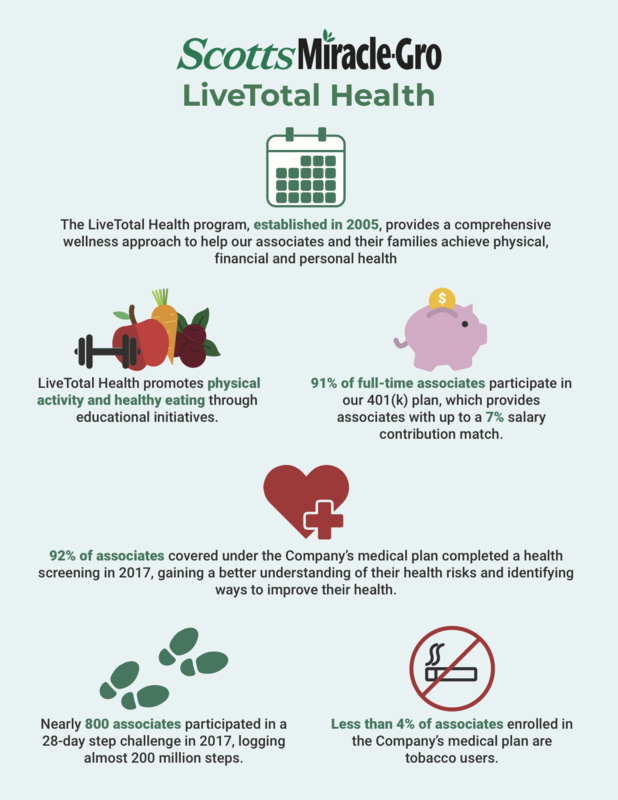 In 2017 ScottsMiracle-Gro once again saw strong participation in its LiveTotal Health wellness program by associates and their families. Our company established this program in 2005 to support our associates’ physical, financial and personal well-being. Throughout the year, associates access a range of benefits including preventive health screening, investment education and healthy living events like step challenges. Learn more about our commitment to our associates’ well-being by viewing the most recent Corporate Responsibility report here. The Scotts Miracle-Gro Company is the world's largest marketer of branded consumer products for lawn and garden care. The Company's brands are among the most recognized in the industry. The Company's Scotts®, Miracle-Gro® and Ortho® brands are market-leading in their categories, as is the consumer Roundup® brand, which is marketed in the U.S. and certain other countries by Scotts and owned by Bayer . We maintain a minority interest in TruGreen®, the largest residential lawn care service business, and in Bonnie Plants®, the largest marketer of edible gardening plants in retail channels. The Company’s wholly-owned subsidiary, The Hawthorne Gardening Company , is a leading provider of nutrients, lighting and other materials used in the hydroponic growing segment. For additional information, visit us at www.scottsmiraclegro.com.